This unusual contemporary French Buckwheat Bâtard or as the baker Eric Kayser calls it Paline, is a favorite of the author of the Local Breads and Kaisers’ regular patrons who wait in line to buy his breads at his boulangerie on the rue Monge in Paris. 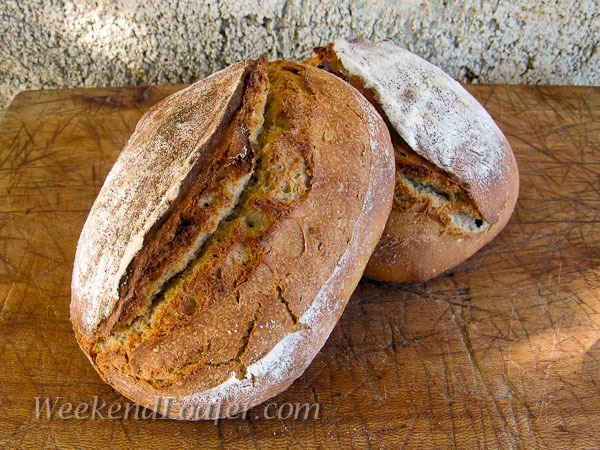 Kaisers’ creation is shaped in a classic French bâtard style…but uses buckwheat and a liquid levain, a break from the accustomed traditional French technique, to make this delicious bread. Buckwheat is a low-gluten grain with a distinctive gray-blue color that gives an earthy rich flavor to the pain. The recipe has sufficient bread flour in the formula to help raise the low-gluten buckwheat (which I upped the percentage a bit from the original recipe) making for an airy moist crumb. I thoroughly enjoyed reading the narratives introducing the regional breads ,the informative stories of the talented bakers and it has been a really good book to bake from. It is filled with some outstanding classic bread recipes…but if the oversights in the formula were caught before going to press…it would have made it a GREAT book. This is one of the many recipes in Local Breads that has an error in it, unfortunately! When I glanced at the overall formula for the levain build it looked way off and I could see right off the bat that it wasn’t going to work…and the corrections from Leader posted on Fresh Loaf needed to be amended as well to make the levain work. 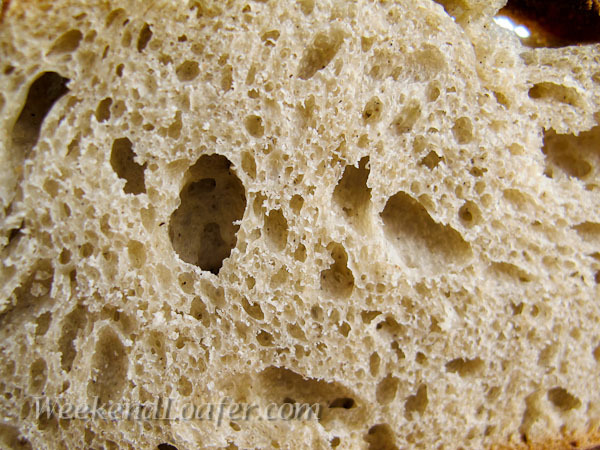 The next time I make this bread, I will add one series of folds after the first hour of fermenting the dough to add some strength, redistribute the natural yeast and help even out the final structure of the crumb. The rest of the methodology worked out fine. 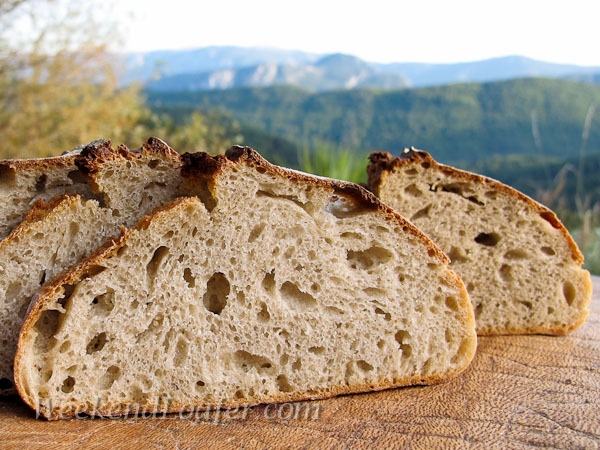 The Paline has a pleasant earthy taste, a nice open crumb and a thick crunchy crust. I cannot believe I am almost finished with the first half of the book dedicated to Real Parisian Breads, Old and New. To wrap up the last two recipesremaining in the chapter I converted my stiff levain, which I prefer to use, to a liquid version. One of the holdouts left to bake in the section with liquid levain is the fabled croissants. I just finished my first attempt at making the croissants… they come out looking OK, but did not have the airy cell structure and no real defined layers. I will have to try them again using better quality butter and maybe adding some bread flour to the mix. I had a feeling the croissants would not be an easy one …. Take your levain out of the refrigerator and mash the levain with a whisk in a bowl with the water. Add the flour and stir with a spatula until it comes together. Place the levain in a covered container and let it sit at room temperature for 8-12 hours or until it has doubled in volume, the surface will be riddled with bubbles and have a musty aroma. Pour the water into a large mixing bowl or the bowl stand mixer and mash the levain with a whisk until it is dispersed. Combine the flours until all the ingredients are incorporated. Cover and let it rest for 20 minutes, while the flour hydrates and the gluten begins to develop. Kneading By hand: Turn the dough out onto your work surface. With floured or oiled hands knead a few strokes to bring the rough mass into a ball, flatten out the dough, evenly disperse the salt and continue kneading for 12 to 15 minutes. I found that this dough to be a little on the dry side so I worked in a little water till it felt a little sticky and loose. Knead the dough using a combination of the French kneading technique and this method if the dough is really wet to start as shown in these video clips. For the first couple of minutes it will be a sticky mess on your work surface, but do not yield to the temptation of adding more flour. Stop occasionally and use your bench scraper to gather any stray dough off of your work surface. Continue until you have a good gluten development. I kneaded by hand for 15 minutes let it rest and then continued for 10 minutes more! A good work out! You should be able to gently stretch a piece of the dough into a thin membrane that you can almost see through without it tearing. By machine: Add the salt and mix at medium speed until the dough cleans up the bowl and you reach a good gluten development. About one hour before baking, preheat the oven to 500° with a baking stone in the middle and a tray in the bottom of the oven for steam. I like to add one cup of water to the bottom tray a few minutes before putting the loaf in the oven to produce a moist environment for baking the proofed loaf. Gently turn the dough out onto a lightly floured counter, trying not to fold the dough on itself to preserve structure of the dough. Divide the dough into 4 equal pieces ( I divided it into 2 pieces)and pre-shape into round or rough rectangle, cover and let rest for 10 minutes. Shape into a bâtards (video clip) and put the seam side down on floured couch or put in banneton seam side up and cover. Proof the loaves until the indent of your floured finger springs back slowly. Gently transfer the bâtards onto parchment paper or floured peel, score and slide onto the baking stone, add an additional ¼ cup of water for steam if necessary and turn down the oven to 450°, continue to bake for 20 to 30 minutes. Bake the loaves until they are an even dark brown. For a good crust you want a bold bake, when you tap the bottom of the loaf you should hear a hollow thud (that is a technical term).